The feline tail often is an effective communication device. If your cute kitty swishes her tail around a lot, don't assume for even a second that it means she's feeling joyous. Although a wagging tail almost always is a sign of happiness in dogs, the action often is the polar opposite in the feline world, so be very cautious. If your cat's tail begins swishing abruptly, it could mean that she's feeling irritated about something, especially if the movement is rather swift. For example, if you're stroking your cat's back and she simply isn't in the mood, or you are doing it for too long, she may end the activity by suddenly standing up and walking away, all the while swishing her tail around. This just is a mildly annoyed cat -- no biggie. The swishing of a feline tail also often points to fear and protectiveness. 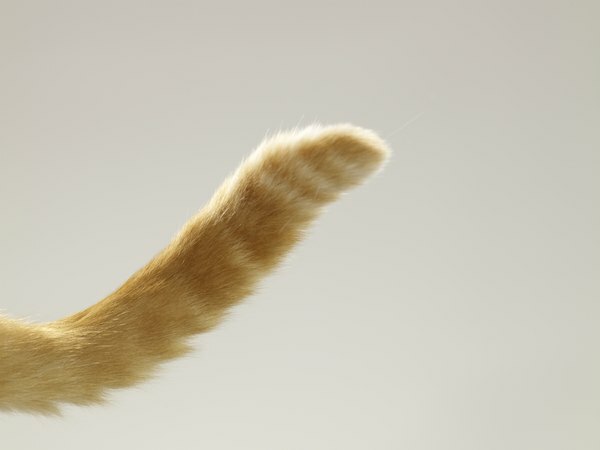 If your cat's tail is swishing back and forth, she's probably feeling terrified of something. Be on the lookout for other key indications that all is definitely not well in kitty land, including an arched back, fur standing on end, flattened whiskers and ears pulled back. This poor cat certainly is not in her element at the moment. 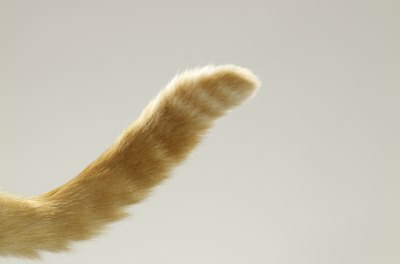 A cat's tail beating back and forth violently and rapidly usually signifies aggression. This kitty is no happy camper and someone or something is about to feel her wrath. A quickly swishing tail usually means that a cat is ready for attack. If your pet's tail is thrashing like this, be prepared for her possibly to scratch or bite. Leave any cat in this emotional state alone for a while. Cat bites and scratches often are very dangerous, so play it safe. Sometimes, a swishing feline tail isn't negative at all. If your cat's tail is pointed straight upward and is shaking or trembling softly, she's probably feeling elated. Maybe she's really happy about seeing you after the end of an unusually long workday. Perhaps she sees you opening the cabinet door and thinks that you're about to offer her some special turkey-flavored kitty snacks -- yummy! Whatever the case, motion of the tail isn't always a bad thing.